We strongly believe in CMH as the future of the industry. Read the article below to answer any questions you have. Or come in, check them out and talk with us! We’re here to get your grow the next level. The industry is changing, and competition among growers has become fierce. If you want to keep your edge, you need to stay up to date on the latest lighting technology. This means getting better acquainted with ceramic metal halide (CMH) grow lights. Ceramic metal halides, also called light-emitting ceramics, are the newest innovation in HID lighting. They bring many benefits to the table, with only a few drawbacks. What are Ceramic Metal Halide (CMH) Grow Lights? CMH metal halide grow lights are made with an arc tube constructed of a ceramic composite instead of quartz or PCA. This allows the tube to reach a higher temperature. To achieve the lower operating temperature in HID lamps made with quartz or PCA, a combination of gases must be used that don’t necessarily produce the optimal light spectrum for photosynthesis. The higher operating temperature of the ceramic tube allows for an ideal mixture of gases. This creates a fuller spectrum of light that increases the growth, overall health and yield of your plants. A special ballast is needed for ceramic metal halides. Not just any digital ballast will do. CMH lamps require a low frequency, which makes high-frequency digital ballasts incompatible. Depending on the quality of the system and where you shop, complete CMH set-ups range in price from US$200-$1,100, with an average price of US$550. Most set-ups hold one 315W lamp, but there are some fixtures that hold two lamps for a total of 630W. The lamps themselves cost between US$80 and US$100. The lamps come in two versions: the 3,100 Kelvins (a full spectrum) and the 4,200 K (a blue spectrum). Manufacturers claim you will only need to replace your lamps every two years. The money you save on your power bill is the No. 1 perk of switching to CMH grow lights. Although the initial cost of the system is more expensive than other HID systems on the market, CMH systems will save you money in the long run. Some jurisdictions even recognize them as energy-efficient lighting systems and offer incentives to offset the initial cost. Some suppliers claim one 315W CMH is equivalent to one 1,000W HPS lamp in terms of yields. Others have reported that you need two 315W CMH lamps to produce the same yields as a 1,000W HPS. The varying reports probably have to do with other elements in the garden and the gardener’s skill level, and the truth probably lies somewhere in the middle. In any case, the general consensus is that your yield per watt is greater with ceramic metal halides, and you will be spending much less on electricity to power your lights. These lights also have a low heat output because of their low wattage. One watt from a grow light creates about 4 British Thermal Units (BTUs) of heat that need to be cooled. Let’s say you have a small room with four 1,000W HPS grow lights. Your four lights alone create 16,000 BTUs of heat that need cooling. If you trade those lights in for four 630W fixtures, which will match, if not exceed, your current yields, you will only create 10,000 BTUs of heat. Your air conditioner won’t have to run as often, and you’ll see savings on your power bill. The low heat output of CMHs make them an ideal choice for small grow spaces, such as closets and grow tents. Another benefit is that with the ballasts required to run them, you won’t have to deal with the electromagnetic interference (EMI) issues many growers experience with digital ballasts. High levels of EMI from digital ballasts are known to interfere with cellphone service, radio, Wi-Fi and cable television, and the Federal Communications Commission hands out citations to people who violate EMI emission standards. One final advantage ceramic metal halides bring to the table is their superior light quality compared to other HID lamps, which is due to a few factors. First, they have a wider spectrum than other HID lamps—a result of the near-perfect, unique combination of salts, halides and gases used in the arc tube. This mixture creates a spectrum close to that of the sun and emits a stunning, crisp, white light. In fact, the color rendering index (CRI) for ceramic lamps ranges from 90-92. To give you some perspective, the sun’s CRI is 100. HPS lamps range from 20-30, and metal halides range from 60-65. The closer the CRI is to 100, the closer the spectrum is to that of the sun. In terms of light quality, ceramics include ultraviolet and infrared rays in their spectrum, which plants love. The higher amounts of UV rays create stronger, woodier stalks. This means the growth and vigor of your plants will be unmatched, especially in the vegetative stage. Due to the incredible growth CMHs produce, growers have reported great success when using silica supplements with these lights. Silica helps with cell division and creates stronger cell walls, which makes the leaves, stalks and branches significantly stronger and better able to withstand the weight of the fruits. As an added bonus, pests don’t like woody stalks because they are too hard to chew on. Compare it to eating a tender, juicy steak as opposed to eating an overcooked, dry steak. Which do you prefer? Finally, CMH ballasts use square-wave technology. When you look at the graph on the back of the box your bulb is packaged in, notice the high peaks and low dips. The peaks are an indicator of energy pushing out of the bulb. The low dips indicate light trying to travel to the next peak. You can see this with your own eyes when you take photos and videos of your growroom. With most HID lights, you’ll see bands of light on your photos. The bands of light are the peaks in the graph, and the spaces between them indicate the dips. With square-wave technology, there are fewer dips. A steadier beam of light is produced, which means your plants receive more light over their lives. There are two main drawbacks to CMH grow lights. The first has already been mentioned, which is the initial cost. If you are like most growers, you probably took the most affordable route when setting up your garden. However, as your knowledge and experience increase with time, you may see the value in upgrading certain components in your growroom. Quality lighting pays dividends at harvest time. This, coupled with the energy savings over the long term, make the initial cost of CMHs worth it for many growers. The other drawback is that growers must use extra caution when working in the growroom when the lights are on. Many CMH grow lights come with warnings from manufacturers that suggest growers should not be around the lamps for more than a few minutes at a time while they are on, unless adequate shielding or other protection is used. This is because if the outer envelope of the lamp is broken or punctured, you run the risk of serious skin burns and eye inflammations from short-wave UV radiation. It is only a potential drawback if you like to work in your garden for extended periods while the lights are on. Alternatively, you can work during the dark cycle. A green LED headlamp can provide you with light while you prune or water. The green light will not disrupt the plants’ natural rhythms. Another option is to use a reflector with a lens covering the bulb, but the disadvantage of this is reduced light to the plants. It is important to note that, overall, CMH lamps are safe, but it is always better to be safe than sorry. The bottom line? If you want to keep up with your competition, you should considering making the switch to ceramic metal halide grow lights. You’ll be a happy grower come harvest time if you do. Winter is here, don’t get stuck out in the cold. With parking behind our shop we offer discreet shopping and now pickups in our warehouse via our huge garage door. Come in to purchase or place your order and we can load up your truck, car or van in the warmth of our warehouse. We’ve experienced an uptick in Coco coir sales here at Advanced Garden Center and want to take a moment to explain what it is, does and why people are making the switch from traditional soil grow media. Coco coir is the fibrous strands found between the coconut and husk, it’s a by-product of processing coconuts and has recently become available for home gardeners. Coco looks just like a high grade soil, and comes in bags (ready to use) and very commonly as compressed bricks that expand when water is added (very convenient for shipping). Many types of coco are available now, coir, bricks, croutons, mats, soiless mixes, etc. Coco coir is a by-product of the coconut harvest. It can turn into waste or high quality growing medium. It’s a no brainer as to the benefits. Is Coco Hydro or Soil? It’s actually “Soiless”, which is like a hybrid of both and needs to be treated like hydro, even though it looks like soil. Use quality hydro or coco specific nutrients and ph to 5.8, and water as if it were soil. You’ll have to feed every water cycle or alternate between the two since coco is an inert medium. Growth for coco is faster than soil, but less than or equal to hydro setups. Hard to overwater – One of the most impressive attributes of coconut coir as a growing medium is the level of aeration and structure supplied to the rootzone. Coco is difficult to over water. Basically, if you supply too much water it will just run out the bottom of the container, and will not become water logged (anaerobic). The coconut fibers are much tougher and coarser than those of peat for example. This means more airspace is available for drainage and to supply the roots and soil life with more air. Coir fiber will not compact over the course of the grow. You may have experienced filling the pot right to the top with peat at the start of the grow, only to find that a third of the media is “gone” by harvest. What is happening is that the peat fibers are eroding from the force of watering, saline conditions, and the roots compacting the media. This robs the crop of valuable air space in the rootzone, and increases salt build-up as drainage is impeded. With coir fiber there is little if any compaction of the growing media over the cropping cycle due to the higher content of lignins and cellulose found in the physically coarser fibers. In container grown crops, little compaction is evident. Plants receive optimal water to air ratios over the course of the entire crop, not just the first few weeks. Fewer pests! – You have a lot less chance of spider mites with coco, including most other soil pests. You’re not immune, just safer is all. Impressive Growth – The most common comment I hear from coco growers is the fantastic growth rate. There are several reasons for this, and the accumulative effect is vigorous plants and large fruits and vegetables. The cool thing about coco is it can work with a variety of grow styles with impressive results. For this guide we will focus on good ol’ hand watering, just like you would using soil. A good mix is equal parts coco & perlite, we’ve had the best growth rates with this ratio. The down fall is that it will require more frequent watering since it’s such an airy mix. We normally use roughly 75% coco & 25% perlite for mixes, it’s a great ratio and performs very well. Coco performs well by itself and is very forgiving about watering. There are a lot of coco specific nutrients out there and we highly recommend them for ease, but beware as some can be a bit pricey. However you can use any hydroponic nutrients. If you are not using coco specific nutrients then YOU WILL NEED to use CalMag or some equivalent supplement to correct the calcium issue that coco has, especially if you are using purified or distilled water. Just follow the directions on the bottle and add every time you use nutrients. There seems to be a bit of confusion when it comes to watering coco, even intimidating depending on who you listen to. We are here to tell you it’s very simple. First off, use light pots, don’t get some heavy material container, plain plastic works great, buckets or bags work well, smart pots are fine too. If you lift the pot you can tell if it needs watering by how light it is. Learn to judge the halfway weight by feel, when the pot feels less than half full, water it. Try this lift technique for two weeks checking daily. You’ll be a pro at the end of that two weeks. Indoors, normally plants can go 1-3 days between waterings in 1 to 5 gallon containers. Young plants may go 5 to 7 days between waterings. 10 to 15 gallon containers may go 10 to 14 days. Outside grows may require a more frequent schedule, more so than soil and even more so if you mix in perlite. Once flowering begins, the water consumption will increase and you may be watering daily when you factor in the size of the plant and container size. This may sound a lot like a soil schedule, and that’s just about right. Trying to schedule waterings of more than one plant can get complicated if you’re using the last day as a calculation. That’s why using the lift method is so handy. After some time you can forecast up to 2 or 3 days of when a plant will need watering next with a simple 2 second lift. Give enough water to see some runoff or almost see it, especially when nutes are mixed in. Runoff with plain water means you’re washing out nutrients, coco is very easily flushed. Just like soil, you feed the medium, and the medium feeds the plant. Coco does not have nutrients like soil, so when your plant enters the veg stage, it’s time to feed. How often to feed is something you will have to figure out, there’s no one way for anyone to tell you and this is where a little grow experience is very helpful. Factors like lighting, pot size, amendments, can all affect your feed schedule. The best approach we can offer is to use a very basic baseline and adjust as needed, or follow the directions for your nutrients at a lower dosage and increase as you see fit. We have yet to use any bottled nutrients at instructed full strength that didn’t burn. A generic baseline approach would be the same as hydro. Just like in a DWC setup, start feeding around two weeks after sprout with about 150-300ppm. Do this every-other watering and watch your plant. If she looks hungry, try feeding nutes-nutes-water. If she looks over feed try nutes-water-water. You get the idea. You have to dial it in, and every plant you grow may be different. Increase to 400-600ppm after a few weeks, then eventually up to 800-1000ppm. I rarely go over 900ppm. Coco likes frequent low does feedings, but you can hit them hard when needed. If you over do it a flush should get you back in good shape. This may sound a bit difficult, but it’s not as bad as it sounds, especially once you get a few weeks under your belt. Coco can absorb and release nutrients very quickly, like a broadband internet connection. This is one reason plants grow so well in coco, the high CEC ratio makes plenty of food available to the plant when it wants it. Most coco comes out of the bag at 5.5 – 6.5, this is great! When you water or feed your plants, make sure to ph to 5.8. Coco is very forgiving either way, but growth really slows over 6.5. There is really no difference in starting a seed in coco versus soil. Basically you pour coco into a container, water it, bury a seed about 1/4 inch, and give it a few days. Do not cover with plastic or mist, just keep it moist enough that the top layer does not dry out until the plant has a set of leaves or two. Looking to grow bigger, better plants? PowerVEG T5 grow lights can be the key to better overall plant growth. •Is the first and only T5 grow light to incorporate a full, broad spectrum and UVA and UVB light, both of which are important for strong, healthy plant growth (UVA = 315nm – 400nm : UVB = 280nm – 315nm). •Has the exclusive EYE HORTILUX spectrum. •Is the only T5 grow light made in the USA!!! •PowerVEG can be used in any existing T5 54W HO lighting fixture. •If running 24 hours ON with standard T5, reduce cycle to 19 hours when using 100% PowerVEG. 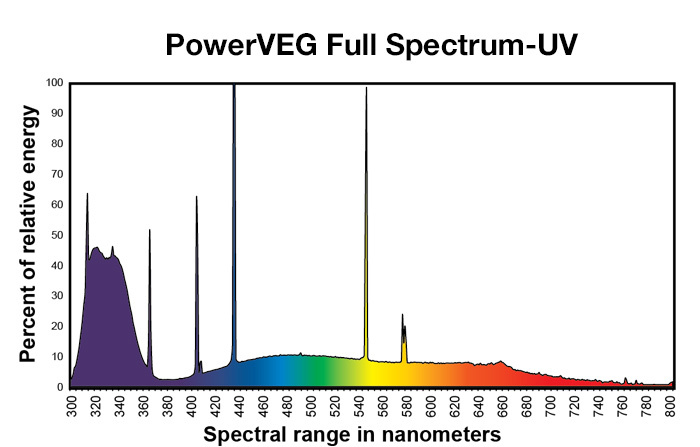 •When using a 50% PowerVEG/50% standard T5 light mix – NO CHANGE in light cycle necessary. •When using an 18 hour ON cycle or less – NO CHANGE in light cycle necessary regardless of lamp mix. •The recommended height above the canopy of plants should be between 8”-16”. The optimal height is 12”. Advanced Garden Center is excited to introduce Mills Nutrients to our line of premium plant foods for hydroponics, coco, & soil applications. Produced and bottled in Holland, Mills nutrients is one of the most complete and yet simple nutrient lines on the market. The whole line consists of just an A + B two part and 3 additional additives, they are used consecutively for transitioning a plant quickly from an aggressive growth vegetative cycle to facilitating rapid flower sites, bulking and ripening. There is also another thing that makes this product unique in that it is a complex blend of synthetic nutrient salts as well as organic compounds so your crop gets a very well rounded diet of bio mineral based elements that have been tested thoroughly in both large production greenhouses and hobbyist alike. The A + B contain all of your essential micro and macro nutrients in a synthetic form of highly available and easily absorbable salts, and is effective in all media based whether its coco, soil, or hydroponics. Basis A + B are derived from high quality sources of NPK. It also contains red iron which is a much easier form plants can absorb. Most nutrients contain yellow iron which is a cheaper source than red iron, and is not as easy to absorb. Basis A + B also contain higher then normal amounts of Calcium and Magnesium than other nutrients on the market. C4 is introduced in the 2nd week of the blooming stage and is guaranteed help facilitate rapid flower development using a unique blend of macro and micro nutrients, trace minerals and carbohydrates. The result is noticeable increased amounts of fruit sets, with dense uniform development, and high levels of oil and aroma production. It helps your plants move sugars and other important amino acids to feed young forming flowering sites. This additive also contains organic plant hormones that give it the hard push it needs as it enters the late stages of flowering. (Discontinue use of C4 when Ultimate PK is introduced). ULTIMATE PK is the “ultimate” bloom booster on the market today! Compatible with all growing medium and watering methods. Used in that last couple weeks of the flowering cycle to add extra weight and density to your flowers as they enter their final stages of maturity. It also helps clean out extra salts that develop though the growth cycle and gives your roots a deep flush before harvest. This PK booster contains highly absorbable mineral salts similar to what is found in other very costly PK boosters. 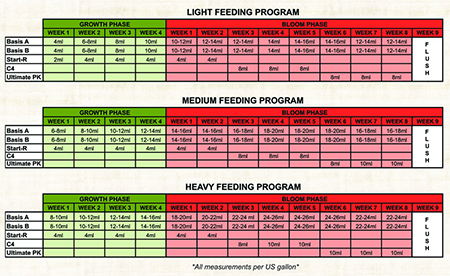 Mills feeding chart, its very user friendly and straight forward. They break it down into three different parts a light feeding, medium feeding and a heavy feeding program that contain information on how to use it and how much of it to use at what time though out the plants life cycle. In conclusion Mills is a beginner friendly nutrient that will yield a professional result as long as your climate is appropriate for what ever it is you choose to grow with this line of nutrient. Advanced Garden Center is now open for business. Centrally located, right off of I-65 and Fern Valley Road, Advanced Garden Center is ready to assist you with your indoor hydroponic growth needs. We carry a wide selection of products from nutrients, supplements, power and lighting, tents, water cycling systems, and additional accessories. Our one stop shop has what you need to set up a fully functional modernized indoor hydroponic growth system. Indoor growers know that plant nutrients are crucial to their success. Plain-old soil fertilizers, often lacking in trace minerals, just won’t do! To assure maximum growth and avoid deficiencies, always use the highest quality nutrient solutions designed for soil and soil-less growing you can find. We carry items created and used in CA and CO.
Advanced Garden Center makes it easy with our wide, carefully chosen natural supplements that combine macronutrients (nitrogen-phosphorus-potassium) and micronutrients (zinc, iron, manganese, other trace elements) in just the right balance for maximum results. 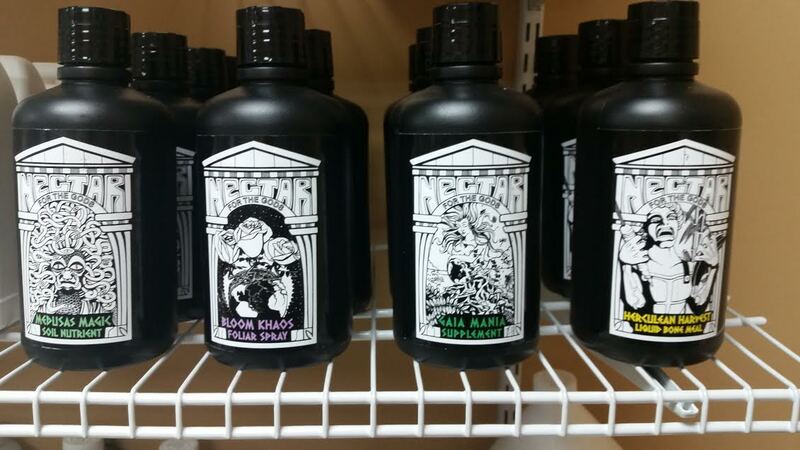 We also carry an array of specific-use formulas including root stimulators, and growth and bloom boosters, all designed for the demanding needs of indoor gardens.